Wondering how we got into this mess and what might be done? 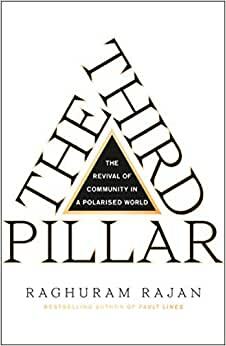 From one of the most important economic thinkers of our time, The Third Pillar is a brilliant and far-seeing analysis of the current populist backlash against globalization and how revitalising community can save liberal market democracy. Raghuram Rajan, author of the 2010 FT & Goldman-Sachs Book of the Year Fault Lines, has an unparalleled vantage point onto the social and economic consequences of globalization and their ultimate effect on politics and society. In The Third Pillar he offers up a magnificent big-picture framework for understanding how three key forces – the economy, society, and the state – interact, why things begin to break down, and how we can find our way back to a more secure and stable plane. The ‘third pillar' of the title is society. Economists all too often understand their field as the relationship between the market and government, and leave social issues for other people. That's not just myopic, Rajan argues; it's dangerous. All economics is actually socioeconomics – all markets are embedded in a web of human relations, values and norms. As he shows, throughout history, technological innovations have ripped the market out of old webs and led to violent backlashes, and to what we now call populism. Eventually, a new equilibrium is reached, but it can be ugly and messy, especially if done wrong. Right now, we're doing it wrong. As markets scale up, government scales up with it, concentrating economic and political power in flourishing central hubs and leaving the periphery to decompose, figuratively and even literally. Instead, Rajan offers a way to rethink the relationship between the market and civil society and argues for a return to strengthening and empowering local communities as an antidote to growing despair and unrest. The Third Pillar is a masterpiece of explication, a book that will be a classic of its kind for its offering of a wise, authoritative and humane explanation of the forces that have wrought such a sea change in our lives. His ultimate argument that decision-making has to be watered at the grass roots or our democracy will continue to wither is sure to be both provocative and agenda-setting across the world. Start reading The Third Pillar on your Kindle in under a minute. RAGHURAM RAJAN is the Katherine Dusak Miller Distinguished Service Professor of Finance at the Booth School of Business at the University of Chicago. He was the Governor of the Reserve Bank of India between 2013 and 2016, and also served as Vice-Chairman of the Board of the Bank for International Settlements between 2015 and 2016. Dr. Rajan was the Chief Economist and Director of Research at the International Monetary Fund from 2003 to 2006. Dr. Rajan was the President of the American Finance Association in 2011 and is a member of the American Academy of Arts and Sciences and the Group of Thirty. In 2003, the American Finance Association awarded Dr. Rajan the inaugural Fischer Black Prize for the best finance researcher under the age of 40. The other awards he has received include the Deutsche Bank Prize for Financial Economics in 2013, Euromoney magazine's Central Banker of the Year Award 2014 and The Banker magazine's Global Central Banker of the Year award in 2016. In that year, Time magazine chose Dr. Rajan as one of the 100 most influential people in the world. 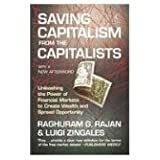 Dr. Rajan is the co-author with Luigi Zingales of Saving Capitalism from the Capitalists (2003), and the author of Fault Lines: How Hidden Fractures Still Threaten the World Economy, for which he was awarded the Financial Times Goldman Sachs prize for best business book in 2010. His tone is soft, his language sedate, his prose erudite, but make no mistake in his new book Rajan joins the populist movement. He calls “communities”, what most of us would call “people”. He calls “inclusive localism” what most of us would call “direct democracy”. He asks for globalization to be “managed”, but he means “slowed down.” If the reader has the ability to endure the prolix historical analysis and the central banker cryptic prose (Alan Greenspan famously said “if I seem unduly clear to you, you must have misunderstood what I said”), she will find that his positions are little short of revolutionary, especially coming from a Chicago boy, who worked at the IMF and ran a central bank. He abandons the Chicago School of antitrust with its single-minded focus on consumer welfare to embrace whole-heartedly the Brandeisian approach promoted by the like of Lina Kahn. He rejects the shareholders’ value maximization mantra championed by Milton Friedman and the Chicago School to advocate maximization of the value of the entire firm, including thus the claims of employees and suppliers. He defines the European monetary integration “Europe’s mistake to go much beyond a common market in goods and services before solidarity has built up.” His call to bring power back from international organization “first to the nation, than to the region, then back to the community so people have a sense of agency” echoes the arguments of Brexiters. He even calls for a democratic reform of the IMF, which will reduce the U.S. power over this institution. Coming from a normal peon, these positions might be seen as moderate. Coming from a highly regarded central banker, a full member of the Davos elite, they suggest the world has changed. 29 people found this helpful. 5.0 out of 5 starsA must read! It is hard in these times to not reminisce the Austrian economists such as Friedrich Hayek and Ludwig von Mises. They warned of the perils of excessive state control of economies and the need to have decentralized markets that respond to local signals, aggregate demand and supply appropriately, and are not systematically injected with bias or noise by centralized interventions (including sustained monetary interventions by central banks). When I read Raghuram Rajan’s latest book “The Third Pillar: How Markets and the State Leave the Community Behind”, in some ways I got to appreciate the tremendous depth of the thesis postulated by the Austrian economists. The book explains convincingly, in a scholarly manner as well with much humane touch, that when policy control in economies becomes unbalanced towards the center, efficient properties of markets end up being compromised too, either by few large incumbents extracting rents via markets or by ill-informed distortions through central planning; even more devastatingly, features that bind local communities together – such as informal lending, small and medium-sized enterprises, medical support for elderly and those at risk – get eroded, leading to much social discontent and an affinity for populist leaders regardless of the suitability of their long-run plans to address the underlying distortions. In turn, the global economic and social order might end up at even greater risk under such misguided populism, the book contends. I have been a big fan of Raghuram Rajan’s earlier book, “Fault Lines,” that was released post the global financial crisis. It had the novel insight that few commentators then had – that the global financial crisis might have had its roots in the displacement of manufacturing jobs in the developed economies; the pursuit of sustained global imbalances by export-oriented economies; the offering of subsidized housing credit and fueling of asset-price bubbles by banks, government-owned enterprises and central banks in the developed economies; and, the spectacular collapse of the resulting house of debt like a heap of cards during 2007-08. The book had presciently highlighted that if short-term fixes are adopted to addressing the root cause, there could be grave implications for the next decade. “The Third Pillar” reinforces and recognizes the playing out of this concern over the past decade, with what I find a highly unusual but significant extension of the thinking of the Austrian economists – that imbalance towards centralization via the state and the markets has hit at the core of what glues our communities together and made these institutions distant from whom they were designed to serve in the first place. The book gives a historical perspective on evolution of each of the three pillars – the state, the markets, and the community; lays out the disturbing recent trends; and, proposes several thoughtful solutions to restore normalcy. As the key point of the book is that the state and the markets are necessary for healthy and sustained economic growth, but need to maintain balance with the community at a local level rather than disenfranchising it, the solutions also apply to all three pillars – ceding of certain powers by the state, reorientation of the markets and corporations to a broader stakeholder view, and empowerment of the community. It is possible that in steady state, not all of these need to be undertaken together; for example, ceding of powers by the state could help keep markets straight and narrow on what they do best such as efficient allocation of resources in the economy and creative destruction that leads to innovative growth, and by so doing, the community need not get marginalized by a few large players in the economy. Nevertheless, given that we need to transition to the steady state, the book’s solutions need to all be given serious consideration, in my view. In “Fault Lines” too, Raghuram Rajan paid much attention to the role of information technology in propelling our standards of living but simultaneously displacing jobs; there too, he stressed that the most robust long-term solution might be education and skilling since these have the potential to equalize opportunity and that keeps democracy and capitalism both strong as well as balanced. “The Third Pillar” covers much more breadth, helping the reader relate to deserted or dismantling townships that were thriving just a few decades back but are now saddled with crime, drugs, and unemployment; to the re-emergence of nationalism with the familiar themes of immigration and trade staging a comeback as convenient villains; and, to the risk that Hayek called “the road to serfdom” from treading down the path of imbalance towards greater and greater centralized or state control. In the end, sound normative economic theory of the state implies that it should focus on the dispensation of public goods that markets cannot provide so as to enable individuals and the community to grow and thrive; the state should at the same time allow markets to remain competitive and efficient in their provision of private or non-public goods. To me, this comes through as a core message of the book, along with the necessity for community champions to arise and to be celebrated as a decentralized form of leadership that can propel the global growth engine sustainably forward. “The Third Pillar” is beautifully crafted; it reflects the many moods of optimism as well as anxiety that Raghuram Rajan must have experienced during the craft; it inspires (“I hope this book stirs your blood”, he writes) in pushing for better economics as a way to secure and maintain global peace; it engages at a personal level with examples of communities that have gone through the travails but are beginning to rise; and, it covers developments across the globe, both microscopically as well as with a 35,000 feet perspective. You may or may not agree with all of its diagnosis and all of its proposals, but a good author’s or artist’s job is not to solve every problem – it is to make you see things in a way you had not seen before, to get you to reflect deeply, and to convince you to act responsibly. “The Third Pillar” does all of this and much more. Go, read it, I say. Raghu Rajan has written a thought-provoking book that helps explain some of the troubling and puzzling political developments around the world today -- as well as those in the past. (If you ever wondered why religions tend to forbid lending -- and I did -- this book provides a clever and coherent explanation. ) He convincingly argues that communities are important third players in the interaction of markets and governments. Understanding the forces that drive the current predicaments and weakening of communities around the world is one thing. Finding solutions, however, is more difficult. Nevertheless, Rajan makes an equally provocative attempt to do so. 17 people found this helpful.